Okay. I know I shouldn't be surprised. But someone explain the dynamic to me. The word for this kind of rain had to be coined in Southern California. "Spritz" they call it. It's that amount of rain that is barely perceptible. I'm sure the measured amounts will be laughable. "Two-hundredths of an inch", "a tenth of an inch" where it really came down. This isn't enough to create a puddle. But it's apparently enough to turn my usual 25-minute drive into nearly an hour of brake-grinding commute. By L.A. standards, my drive to work should be a breeze. Thirteen miles door to door, 11 of it on the Westbound 134 from Pasadena to Burbank. But just add water, and that short commute turns into a flood of frustration and impatience. First, just getting to the freeway was numbingly difficult. I sat through at least three cycles of several stoplights. And I don't know why. Nearly 20 minutes to go just over a mile. Are there more cars, or do we just hit auto-creep whenever the windshield wipers come on? Not a single accident, but I never seemed to crack the 25 mph barrier. But there were accidents elsewhere. 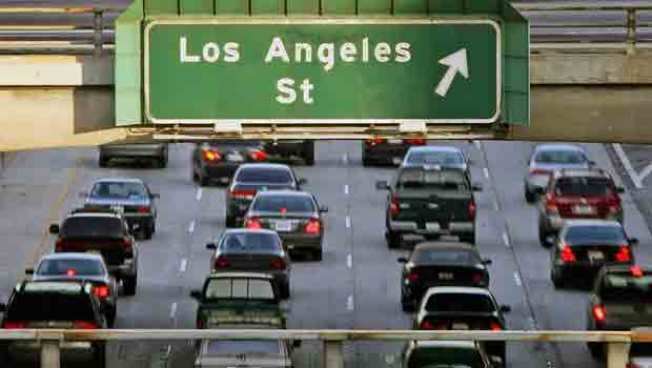 The California Highway Patrol reported 85 accidents during the morning commute, from 5-9 a.m. Wednesday, on Los Angeles County freeways -- compared with 42 during the same period on a dry day a week ago. What happens to all of us when we come face to face with the spritz? So, we're looking for answers. How was your freeway? Your surface street trek? What are your theories on why a little rain is the equivalent of a traffic spike strip? Scroll down to the comments section, and tell us about your drive in. And remember one good thing about a morning rain; it really cuts down on high-speed police chases.